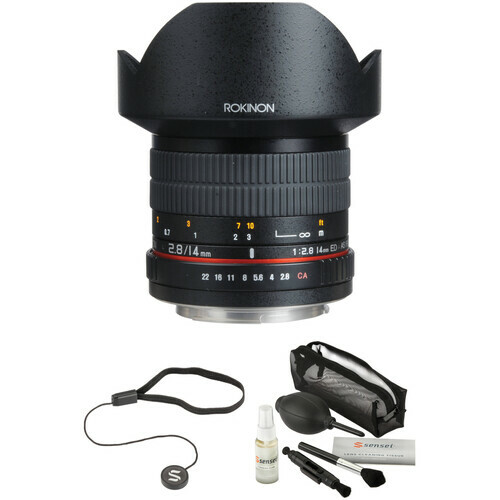 Complementing the lens itself, the Rokinon 14mm f/2.8 IF ED UMC Lens with Accessory Kit from B&H bundles the Canon EF-mount ultra-wide prime lens with a lens cleaning kit and a lens cap holder. The 14mm f/2.8 IF ED UMC Lens for Canon EF from Rokinon gives you approximately a 115° view with dramatic results when used with a full frame digital camera or 35mm film camera. With hybrid aspherical lenses, you will produce sharply defined images with a minimum of distortion and chromatic aberrations. This manual focus 14mm lens focuses as close as 0.9' / 28cm from the lens, and has a built-in petal-type lens hood. With some cameras, Shutter Lock must be disengaged on the camera's menu. Don't lose any more lens caps--the Sensei Cap Keeper Lens Cap Holder keeps your lens cap close at hand. One end of the holder has an elastic band which attaches securely around the lens barrel, and the other end fastens to the lens cap via the adhesive-backed disc. The cap remains tethered while shooting and is easily retrieved when finished. Box Dimensions (LxWxH) 7.2 x 6.2 x 4.3"
Box Dimensions (LxWxH) 6.7 x 4.5 x 2.7"
14mm f/2.8 IF ED UMC Lens For Canon EF is rated 4.4 out of 5 by 327. Rated 4 out of 5 by Donald from Just OK The primary purpose of buying this lens was for astrophotography and landscapes was a distant secondary reason. After owning this lens for a couple of years I decided to add this review, knowing that chances are it will not be read. The pros, it is low cost and can produce above average images of the stars overhead when stopped down a little. But a lot of that depends on the proper exposure and post processing skills. The Cons are the distortion and that it is difficult to correct without resulting in undesirable side effects in the images. Since pictures is all that matters, I have attached two images taken from Yosemite Glacier Point with a new moon. Rated 4 out of 5 by Angel from Very nice for the price I'm using this lens for video as much as photos on my Canon 6D. The lens is good, fast (f 2.8), not too heavy and easy to use. Limited of course by being a manual lens, it has no auto focus or optical stabilisation and aperture has to be set by hand using the ring. I guess you can call it an old school lens. It is not perfect, image quality is good, but not great. I had a similar but cheaper version of this lens also from Rokinon for my cropped censor camera and the improvement is big and visible: Distance in the focus ring is accurate (no more guessing), and the lens is noticeably sharper. It is a big improvement and I'm very happy with my purchase. Rated 4 out of 5 by Colin from Excellent Lens for the Purpose I purchased this lens to use with my 6D for astro photography. In testing it against a brick wall (around three feet away) it was sharp from edge to edge. On the other hand there was severe mustache distortion, the image showed extreme curvature away from the center on both sides. Not a problem with night skies, however I wouldn't use it for architecture photography or anything that has strong vertical lines. Reported by several pro friends this lens has little coma effect and is well regarded for astro photography. It is totally manual, so be sure to obtain focus before stopping it down as the viewfinder or LCD will quickly become too dark to focus. Rated 4 out of 5 by Kenneth from Pretty Good Ultrawide This lens is extremely sharp at f4 and up. This is my first ultra wide and I particularly bought it for landscape work. No complains in regards to sharpness on a 5Dsr, but the distortion can get pretty severe on certain shots. I would not recommend this for group portraiture unless you really know how to control the distortion. Using a lens profile (not included) in Adobe CC helps. Also focusing is a challenge looking through the viewfinder; much easier using live view so keep that in mind. If you are looking for a cheap ultra wide for landscape photography, I don't think you can get anything better at this price point. Rated 5 out of 5 by Whiskcat from Nice lens for astrophotography widefield I use this lens for the main purpose of taking widefield milky way shots of the sky at night. The results turned out great! It's a manual lens, so you have to adjust f stop and focus on your own, which isnt too big of a deal and shouldnt be for any dslr user, though i guess have the option to have auto would have been nice. Heres some tips for shooting the sky. f/2.8, set focus to infinity, exposure 20s to 30s, ISO 800-6400, though i generally use 3200 from my location. For the price, this lens cant be beat. It feels well made, heavy, and the pictures speak for themselves. Rated 4 out of 5 by Anonymous from A Great Wide Angle Lens I was hesitant at first to buy this lens with only a few reviews, but since my purchase I've been very pleased. 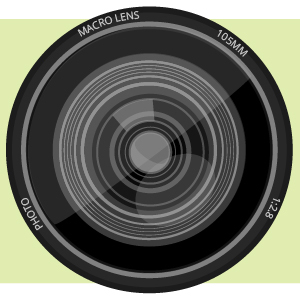 Users should be aware that this lens is fully manual in not only focusing but also selecting aperture settings as well. Achieving the right aperture is as simple as twisting the F-stop ring to the desired setting. Be sure to know that when using a desired shutter speed, the camera is unable to change the F-stop to accommodate. The only drawback to this lens seems to be in visually focusing the subject. The extreme foreground and background are easy to focus, but focusing in between can be a bit tedious. Overall this is a great lens for the price. Rated 4 out of 5 by James from Amazing at twice this price! Much sharper than the Canon counterpart and a fraction of the cost. Great image sharpness from edge to edge and well-controlled chromatic aberration. Wide open there is quite a bit of light falloff but that's standard for ultrawides. The lens loses a star for pronounced complex distortion - problematic if you shoot brick walls or lots of architecture (get a TS). For most landscape, this distortion is very well-hidden. Landscape photography is where this lens really shines! Stunningly wide vistas, massive skys and the ability to really put the viewer's face *in* the subject! Build quality is top-notch for the low price. Built-in hood/cap assembly is a bit fiddly but not annoyingly so. Rated 4 out of 5 by Serottaboy from Deal of the century for milky way photos After reading a lot of reviews and testing a lot of lenses. This is one of the very best options for Canon users to shoot sharp wide angle Milky Way photos at any price. I was amazed at how the stars were round, sharp, and had no comma. I compared to $ Zeiss 21mm, my very, very sharp Canon L 24-70 2.8 I, and many others. Nothing gave me that performance.It has a bit of distortion, but is less bothersome than my Zeiss 21. It is fairly sharp across the lens.This particular copy has decentering. Less sharp and star streak on 1/4 of left side. Even so, I was hesitant to return it for another copy.As always, B&H is my sole photography vendor. Excellent business model and processes. This product is the Rokinon 14mm Ultra Wide-Angle f/2.8 IF ED UMC Lens for Canon. Can I adjust the aperture through my camera or do I have to manually adjust that on the lens? You will need to control the aperture manually through the ring on the lens. What is the circumference of this lens? I need to add a dew heater strip to it for time-lapse. Thanks. The circumference of the Rokinon 14mm is approximately 10.775 inches. Will this fit canon rebel sl1? Also is the AE chip worth the money? Go with the cheaper Rokinon without the AE chip. I use the basic lens when conduction my night workshop and have recommended it to all my clients; great results! How does this lens perform on an APS-C sensor? i originally bought this lens for full frame (5D 11) I have also tried it on my Canon 60D. I would say it is excellent on either camera (full frame or APC sensor camera}. It is very sharp (especially considering the price), about like other prime Canon lenses. It does have a lot of barrel distortion on full frame, less of course on APC. And it is strictly manual, focus and manual diaphragm, the latter can get a bit old, but it doesn't bother me as i have 60 years of manual camera experience. I would say it works fine of APS and if you ever decide to go to full frame, it will also work fine. I hope this helps and good luck. Would this cause vignetting on a metabones xl with a GH5s? There tends to be some small vignetting with wider lenses. You may find that to be the case wide open with the Rokinon adapted with the Metabones XL. Can this lens work on the sony a7ii with an adapter? Yes, but it is available in a sony A mount, so you wouldn't need to use an adapter. Works with D610 and D7000?